Thailand is full of random adventures, and I myself have had many since my arrival, but I thought this week I would clue you all in a little more on the reason for my being in Thailand—my studies in Khon Kaen. My program through the Council on International Educational Exchange (CIEE) has a catchy name, Development and Globalization (DG), but you may wonder what actually falls under this umbrella term? My answer? I’m still figuring it out. In the information packet I received, I understood this program as one that allows me the opportunity to “study complex environmental, development, and globalization issues.” It has done that, and so much more. Unlike our sister program, Public Health, the DG program is not associated with Khon Kaen University near our CIEE school headquarters. It is an entirely separate program that has its own educational model that is much different from most classroom learning models. This program focuses on learning from a ‘human perspective’ by speaking with villagers, NGOs, and government officials among other individuals in the Northeastern Isaan region of Thailand. The Development and Globalization group met with water buffalo herders during our land and agriculture unit. This semester, our program focused on the development and globalization issues of organic agriculture, water management, land rights, mining, and also did a Laos agricultural comparative unit. These five units are primarily student-led and are divided into two-week segments. The first week is comprised of reading…reading…and more reading. In this mix, we also have a few guest lectures, Thai language courses and Thai peer tutor sessions focused on our unit topic as well as two discussion and information-based meetings led by the two student unit facilitators. These “UFac” individuals are responsible for not only planning this week, but also providing the link between the Thai ‘ajaan’ professor’s as well as preparing for the following week of exchanges. In an area affected by a dam construction, this man now fishes where homes used to be. In the second half of the unit, our 10-person DG group, two ajaans, and our beloved ‘wan’ driver make the trek to the local village affected by the development issue we are studying. Throughout our five-day stay, we speak with villagers about their situations and struggles to gain an overview of the issues facing the area. In order to view the situation from the other side, we also meet with government officials who offer the political context. Additionally, we interview local Non-government organizations and NGO persons who are knowledgeable on the subject not only in our current focus area, but also in other areas throughout Thailand. The infamous “wan” ride with the DG “wamily,” including our translator and driver. Upon arrival in Khon Kaen, our group is tasked with making a unit ‘output.’This final project is supposed to be a reflection of what we learned over the past two weeks, and often incorporates aspects that would benefit the affected community in some way. After brainstorming as a group, we work vigorously to finish our project and plan a two-hour “workshop” where we present our findings to our ajaan professors and student interns. Some unit outputs have included a lesson plan on organic agriculture, a 25 page report on organic farming barriers, info-graphics concerning land rights issues, paintings reflecting Laotian agency and dependency, and an information packet provided to the European Union before a visit to a mining affected community. Kaori, myself, Elyssa, and Megan showing our support for Na Nong Bong, a community we exchanged with who is negatively impacted by a mine in their community. Following this workshop is the ever so popular “plus, minus, delta” evaluation where we evaluate as a group what we did great and what could have been done better. Additionally, we have a “sadthi” quaker-style meeting to allow personal reflection and expression of our current feelings after an educationally and emotionally exhausting week. Finally, it is time for a good night’s sleep before the repeat. I have to be honest with all of you. In the beginning of the program, I thought I was in over my head. I saw the little black program planner book as daunting with so many scheduled classes and outside exchanges. I questioned how much time I would have to myself. Yes, I am fully aware that I signed up to ‘study abroad’ but I questioned how much studying was too much abroad. This program is far from what might seem like traditional abroad expectations. I may have not hopped from country to country every other weekend and I may not have shared experiences with many other Richmond students, but I was able to really see Thailand for all its beautiful wonders and civil flaws. I was able to see big city lights and little village dirt roads, I became a ‘regular’ at the local coffee shop, I befriended the coconut ice cream stand lady who knows my order by heart, and I was able to reflect on all these things and more as time passed me by. Although I am sad to be leaving here in a few short weeks, I know that this place, those Thai villagers, and my program friends was, and always will be, a home and family to me. Known as the location of the Casa Rosada (where the president works) and for its weekly demonstrations by human rights groups, the Plaza de Mayo is at the heart of the city. This statue, the oldest monument in the city (1811), stands tall (more than 60 feet) in the center of the Plaza as a commemoration of the May Revolution of 1810 which began the Argentine War of Independence. From 1946 to 1952, Eva Perón was the First Lady of Argentina. With large murals like this and a recently minted 100 peso bill on which she appears, her influence and popularity are still evident today. Notably the first politician’s wife involved in campaigning, her charismatic and sympathetic personality gained her and her husband, Juan Perón, much popularity. She was born in the rural parts of the country as an illegitimate daughter of Juan Duarte’s second family, left for Buenos Aires at age 15 and rose to fame in radio and cinema before entering the political world with her husband. After 6 years as First Lady, she passed away at the age of 33 to cancer. I realized I had not shown a photo of my school yet! So here it is, la Universidad Torcuato di Tella in all its glory! The former automobile plant is now a modern university. The school is named after the Italian immigrant of the same name who earned his wealth inventing a bread baking machine. I am taking three classes this semester about Argentine literature, the dictatorships of Argentina, Chile, and Uruguay, and Latin American cinema. After getting off the plane at Ezeiza International, I hopped in a cab with all my stuff and headed to my host-family’s house. My first impression of the city was that it’s gigantic! My second thought? Graffiti…everywhere. Maybe Boston and Richmond are abnormally graffiti-free cities but I am nonetheless surprised by its prevalence here. I mentioned this to my host-family and they told me that many times the graffiti has political significance and some politicians even pay artists to paint graffiti favorable of them. 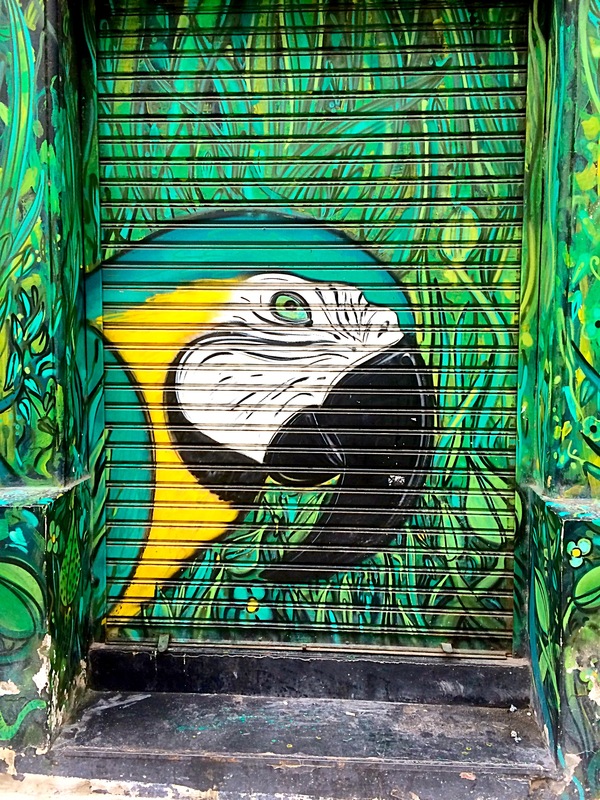 This could be political mockery of an opponent or a statement on governmental policies of animal protection…but then again, it might just be a parrot. 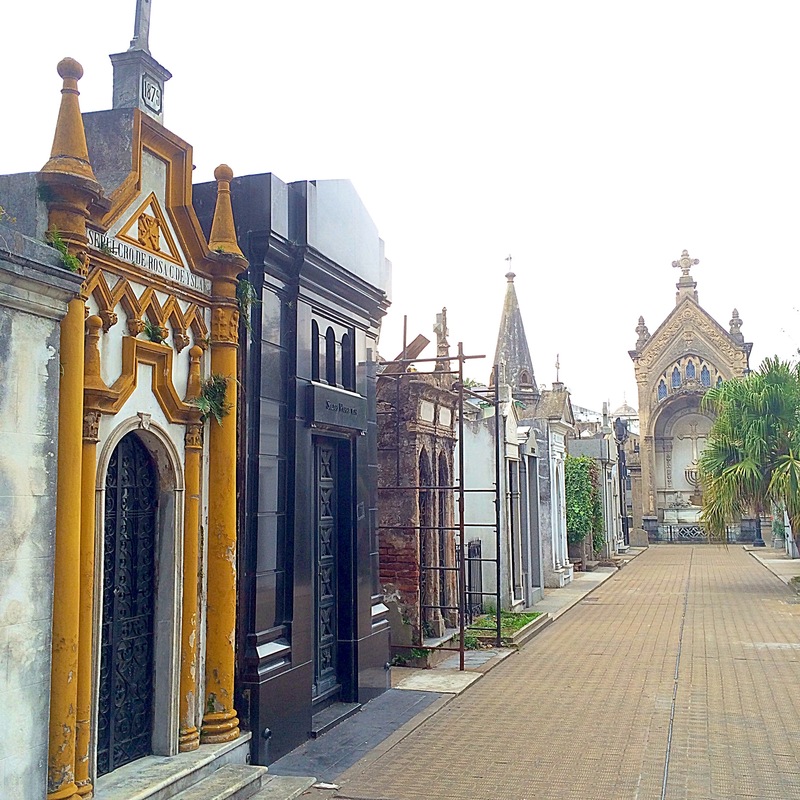 La Recoleta Cemetery is located in the neighborhood from which it gets its name. In 2013, CNN ranked this cemetery one of the 10 most beautiful in the world because of its expansive grounds with the juxtaposition of slightly deteriorating historic tombs and gorgeously maintained modern mausoleums, still utilized by families today. 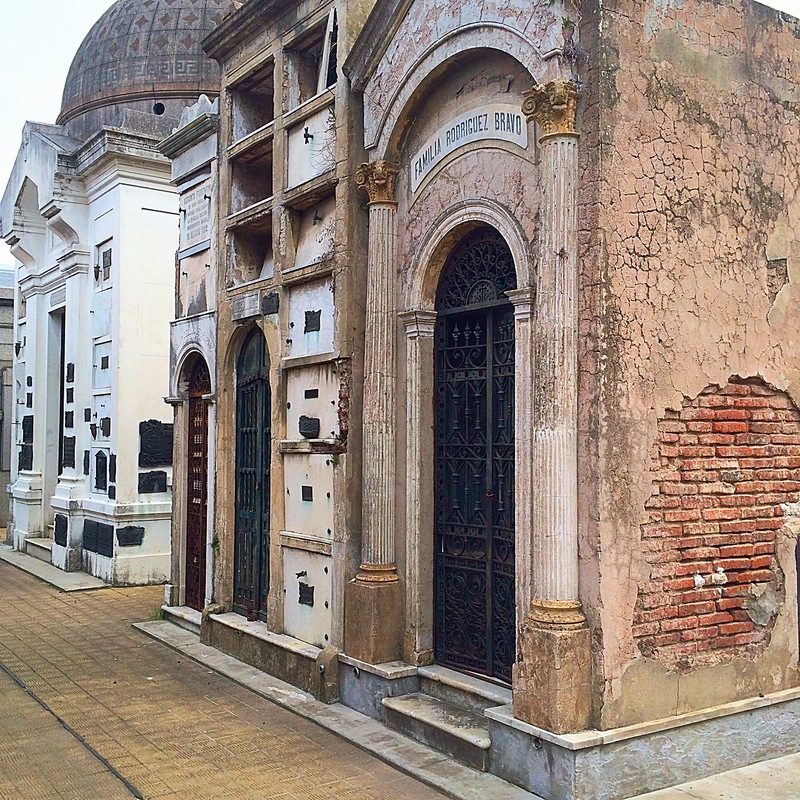 It was too tough to choose just one picture of this amazing cemetery, so here are three! 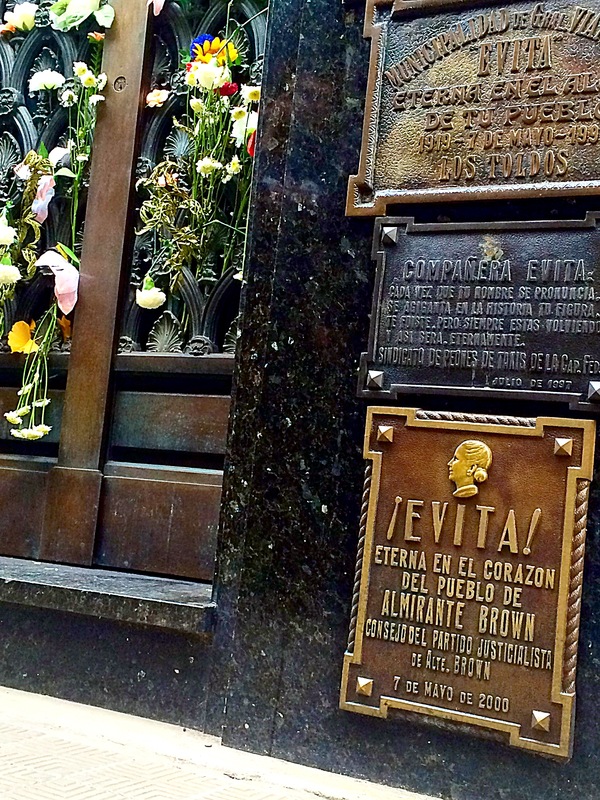 Among politicians, Nobel Prize winners, and entertainers, former First Lady of Argentina, Eva Peron was laid to rest 19 years after her death. In Argentina, the Perons are extremely controversial. You either love Eva or you hate her. Obviously her grave is a bias place to see this as it is perpetually filled with flowers and flooded with teary-eyed visitors. Lauren (another Richmond student) and I searched all around the 14 acre cemetery for her very modest and relatively secluded tomb. 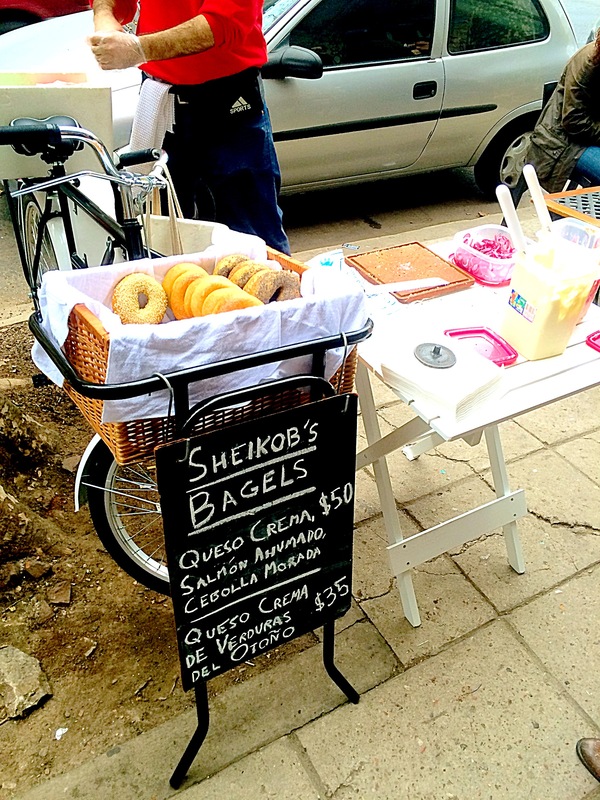 As an”extranjero,” I have found it exciting every time I get to tell someone about the US or see an imported Pringles can in “el supermercado.” Well, on Sundays, there’s one place in Buenos Aires, we Americans can find New York bagels and cream cheese made freshly by a guy named Sheikob. Sheikob is a former PhD candidate who decided to take an adventure and move back to Buenos Aires where he had studied abroad as an undergraduate. Now every Sunday he sells bagels outside a little café in Palermo. (He even has a Facebook page!!) Ben, Bergen, Lauren and I sought him out our first Sunday in the city and told him all about our new adventure, coming from Richmond to study.